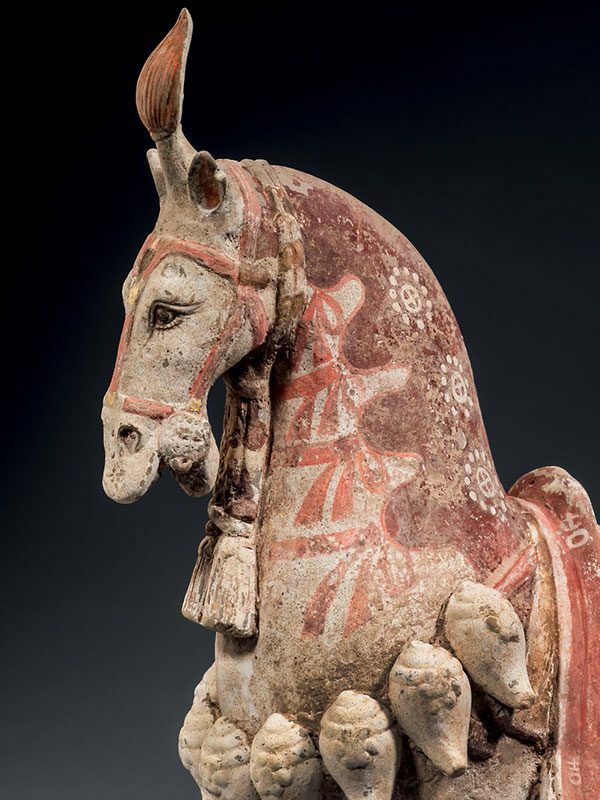 A pottery model of a horse, standing foursquare on a rectangular base with canted corners. The animal has a gracefully arched neck and its well-modelled head is slightly tucked in towards the wide chest, which is decorated with a row of large conch-shells with raised florets, each of which has a moulded flower to the top. The head is carefully modelled with an alert expression, pricked ears, flared nostrils, wide-open mouth and an upturned stiff hair finial. The head has an ornamental bridle and a double-plaited cord around the neck, which extends into a tassel that hangs under the chin. 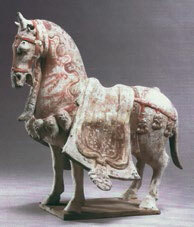 The saddle, which rests on a flared blanket, has a knotted saddlecloth thrown over it. 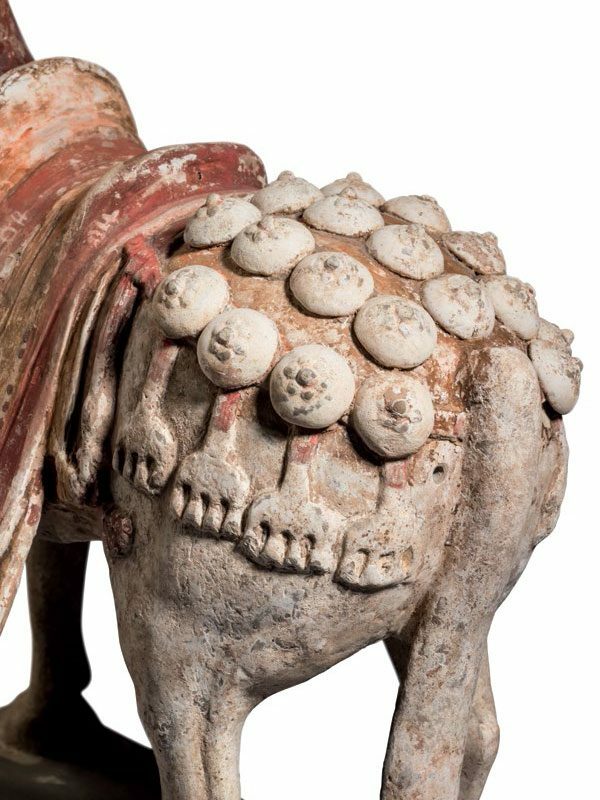 It is held in place with straps hung with tassels and linked over its hindquarters by a leather pad with several rows of ornamental bosses. The saddlecloth is painted in red and orange and inscribed with the Chinese character Ji (meaning ’auspicious’) in creamy white pigments. The long tail is combed straight down. 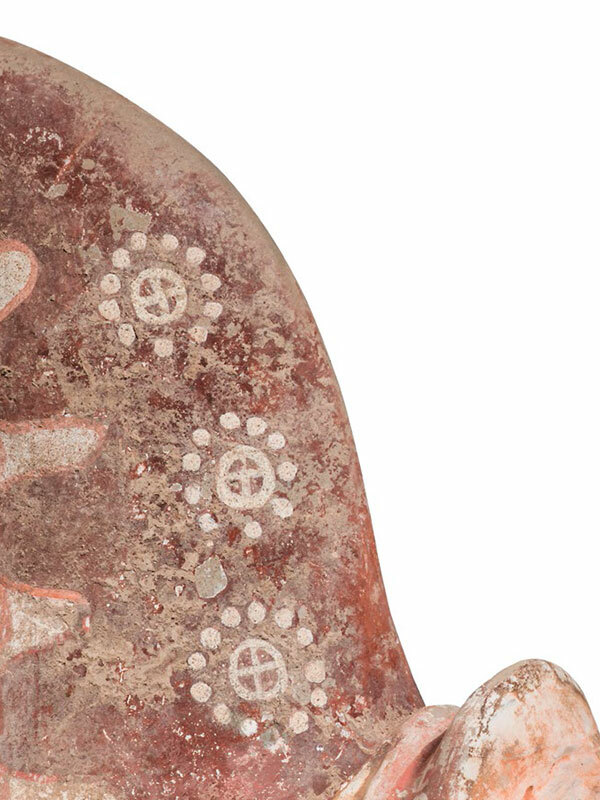 The mane is arranged in waves to either side of the head and picked out in bright red pigments with roundel ornaments on a cream ground, which covers virtually the entire animal and the grey pottery underneath. 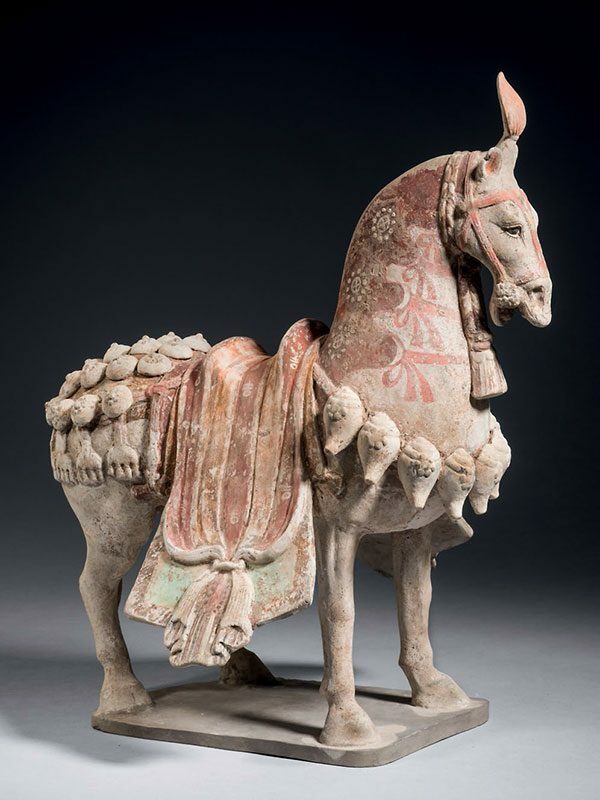 Rotondo-McCord, L. Five Thousand Years of Chinese Ceramics from the Robin and R. Randolph Richmond, Jr. Collection, New Orleans Museum of Art, New Orleans, 2005, p.